I've been offered a pair of RF-35's for $250 (trending around $400 on Audiogon BB) plus a SC-5 (no recent Audiogon sales) for another $25. Any thoughts on how these sound in home theater or 2-channel? How would they compare to Heresy (original) or Forte II's? 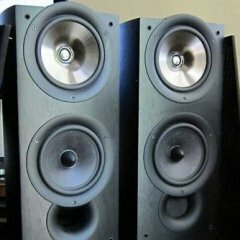 I searched the forums and didn't get any hits on this speaker. Thanks in advance. This forum has been a real help as a newbie to Klipsch! If you were going Heritage in HT, what would you get & why? I am in the Silversport camp. I much prefer the Klipsch Heritage line, especially since they are three way designs. I think the mid horn brings a lot to the table. I own both Heritage speakers and Reference speakers with some Synergy in house as well. I think for music the Heritage line wins hands down. For HT I assume the Heritage would win as well, although I really like my KSB 3.1, B3 and SB3 for home theater duty as well. The reference line is great for clarity but gives little in the way of punch. To me at higher volume the copper woofers also sound a bit tinny. I don't think the range of motion with the copper woofers can compare to the older poly or paper cones. Of course, feel free to disagree. Also, for the money you are looking at spending you are looking at a nice deal, I doubt if you will find any Heritage stuff in that price range. Excellent price for the RF-35's. For HT they would make a very nice setup. For music, pretty good but RF-82s are better IMO. Honestly, you can't go wrong for that price if they are in good condition. Thanks, Bill - sounds like it's worth doing and I can always sell them out again. For 2 channel, I prefer the Heritage sound but I wouldn't turn my nose up at Reference either...and at that price?? ?...very nice. I, for one, actually prefer the RF-35 over the RF-82. Only the RP-280f is a better sounding dual 8" copper tower, imo.